Hi and welcome to my website, I'm Liz and I would love to paint your dog or cat. My watercolor pet portraits can be painted in either a contemporary﻿ style or a traditional style without a full color background. I also paint pet portraits in acrylic. But if you prefer black and white artwork, I draw detailed pen and ink pet portraits on white watercolor paper using black archival ink. There is no deposit needed to commission, just email a photo of your pet, once the portrait is finished it will be shown to you through the internet for your approval. You will only be asked for payment if you like what you see and want to buy it. 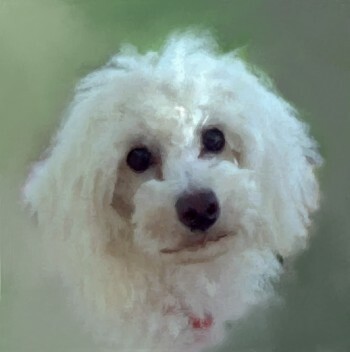 I also make digital pet portraits on ceramic tiles with the aid of my computer and some artistic input. They cost a fraction of an original painting and they look great! The tiles can be ordered framed and are ready for you to purchase within 72 hours. I'm a self taught hobby artist living in Canada. I enjoy spending my leisure time drawing and painting animals, especially the canine variety. My painting medium of choice is watercolor but I also paint in acrylics, make digital art, and of course pen and ink which I feel most comfortable and relaxed working in.